With his first English language production, Sebastián Lelio closes what could be called his feminine emancipation trilogy, conformed by Gloria (2013), A Fantastic Woman (2017) and Disobedience. Based on Naomi Alderman’s novel, the film narrates the return of Ronit (Rachel Weisz), a New York photographer, to her native London after her father’s death. Rav Krushka was a well-respected rabbi in his community and Ronit’s reappearance is not precisely well received by the people in the orthodox circle. Just like in A Fantastic Woman, it is death that ignites the narrative, and once again, it is this event which propels a woman who’s outside of the norm (judged and rejected by her own father) to confront an unaccepting society. 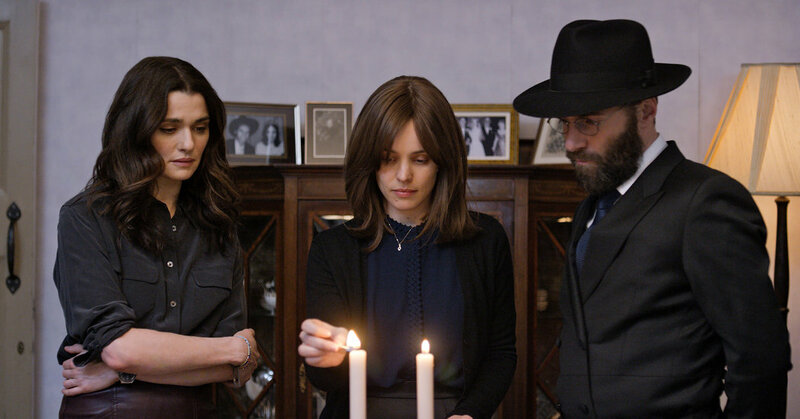 Ronit’s reunion with her friends from youth, Dovid Kuperman (Alessandro Nivola), her father’s disciple and elected successor in the synagogue, and Esti (Rachel McAdams), takes her by surprise. The fact that they are now married to each other seems to her like an unbelievably bad joke. The constant state of melancholy in which Esti is evidently submerged, combined with the perpetually grey London sky, reveals a side of her life that has remained in permanent gloom and dissatisfaction. Ronit’s arrival though, brings a smile to her face again. During a Shabbat family dinner, the subtle disapproval of Ronit’s single status, by everyone at the table, becomes a conversation topic, which results in a comment by her that reveals the absurdity behind the enslaving traditions that ultimately lead to unhappiness. This points specifically to Esti’s case, which Lelio approaches in a way that swerves beyond easy melodrama, in order to address what happens when people forget about themselves in trying to adjust to other’s idea of a rightful life. The reconnection between Ronit and Esti, and the resurgence of their feelings, that lead to their expected intimate encounter, are handled in a masterful way. The visual symbolism used by Lelio is poignant. Their climb up the underground escalator represents a spiritual ascension and a liberation from restrictions. As they exit the station, together, the London sky is blue for the first time. Paradise has been reached. With the help of, the always superb, Rachel Weisz to lead her, McAdams delivers her best performance yet. Together they create powerful scenes that radiate, both with electrifying chemistry and undeniable tenderness. Through his beautiful elegy, Lelio warns about the tragedy of not living one’s own life for fear of not accepting oneself or of not being accepted by others.